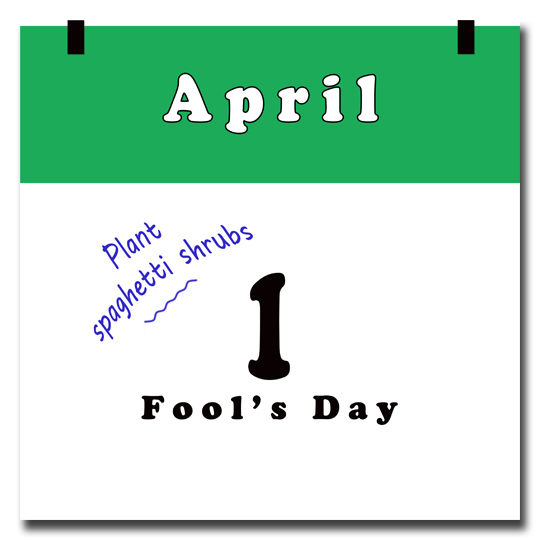 There are many theories on how April fool's day (AFD) began. Who knows for sure which approach or combination of them is true? Perhaps believing any one of them makes us a fool. The rule of the day is if you prank someone after noon on April 1st, the perpetrator will receive bad luck. Just in case you read this article after that time on April 1, I superstitiously nullify any notion that I pulled a "fool-ya". One likely AFD theory is that since the time of the Ancient Romans and Celts, people celebrated the festivities centered around the Spring Equinox, the beginning of a new planting season. With a holiday of mischief-making, often people wore disguises and played pranks on each other. Many historians believe it is how the day evolved into All Fools' Day. Then there are those who believe the best explanation of when the prank day began is when the French switched to the Gregorian calendar. The schedule changed New Year's Day from April 1 to January 1. Many people were slow to catch on to the new year date. April fool's day became a way to mock the dupes who still rang in the new year in spring. I speculate that many were not fools at all, only stubborn old gardeners hanging on to a tradition. I like the old calendar holiday better, with a new year at the beginning of spring, instead of at the launch of winter when hibernation begins. Spring is about renewal - new beginnings and a new growing season. So why not a new year to go with it? Another AFD origin theory is that Mother Nature fools us into believing it is time to plant out those not so hardy plants. Then in a fit of fickleness, she turns down the temperature and throws us a frost or two our way. I've been down that foolish path many times. The AFD holiday can remind us not to be foolish. Plant only the hardy flora now, and wait for spring to warm up before bedding out the tender ones. It is hard not to succumb to the beauties sitting in their pots at our local garden centers. Just remember, plant out the hardy ones at this time, dress the half-hardy ones in protective frost gear, and hold off on planting the tender plants until the next month or two. Wall of waters, frost blankets, cloching devices (cloches) really helps take the foolishness out of planting too early. Anytime we can green-thumb our noses at the weather and win, makes us look wise beyond our gardening years. Some great April 1st hoaxes came from the garden. In 1957, the BBC broadcasted the first known television-staged April Fool's joke. The BBC's Richard Dimbleby, a distinguished broadcaster of the time, narrated a story about a family in Ticino, Switzerland who grew and harvested spaghetti plants. Dimbleby explained how anxious growers feared their harvests would be compromised by late frosts, which would ruin the flavor of the strands. The program even featured footage of the family actually harvesting strands of spaghetti from their shrubs. Viewers called into the station wanting to know where they could purchase a spaghetti bush. You can even watch the original Spaghetti Harvest program on Youtube. 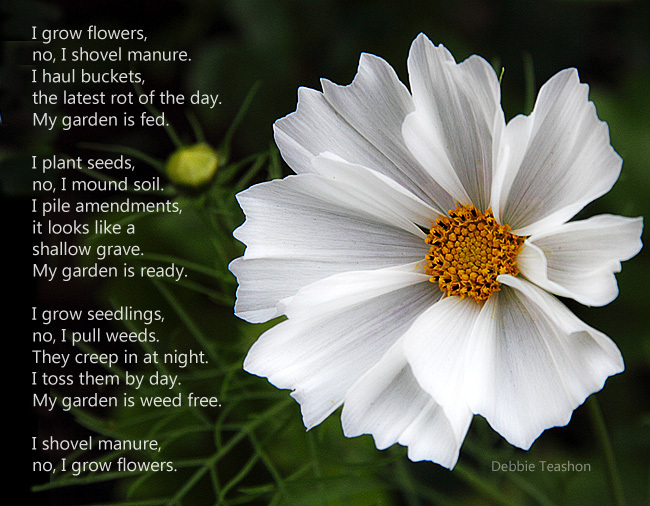 All Fool's Day aside, this month is when gardening goes into full swing. Here on the peninsula, it is time to start seeds, whack weeds, and mow the lawn with a vengeance. Instead of pulling and discarding some of your weeds, eat them. Make good use of the dandelions - the tender, young leaves are nutritious and tasty in salads. Did you know that the flower buds are edible too? Sautéed in butter, they taste like an artichoke and are easier to eat than artichoke flower petals where you have to pull off edible portions with your teeth. Nettles are edible too. However, you do need to wear protective gloves when harvesting to avoid the stinging hairs. Once you cook the nutritious leaves, the sting is gone. I promise you that is no joke. All that I have written is true. I trust that you read this before noon. Win tickets to the Northwest Flower & Garden Festival! The 2019 garden show is slated for Feb. 20-24. 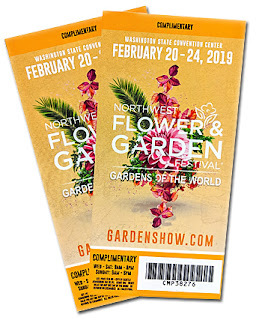 Win two tickets to the Northwest Flower & Garden Festival! Please read the entire post before you comment! Here is all you have to do. 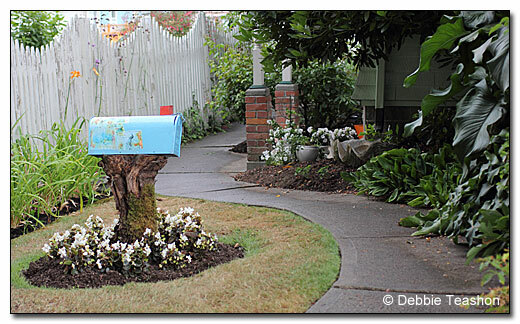 In the comment area of our discussion groups on Facebook, write a paragraph about your favorite display garden, an event from the show, or your favorite reason why you go. You never attended the festival? Write an idea about why you wish to go. To be entered, you must post in the comments. The paragraph(s) can be short or long. Here's the kicker! 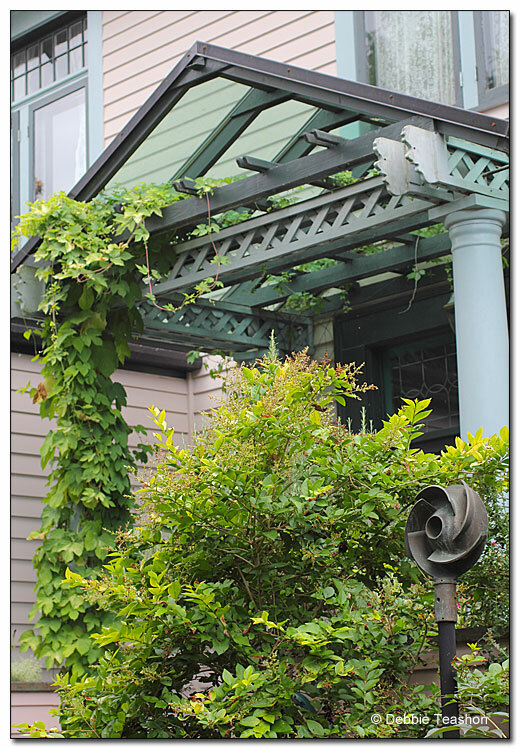 You can also enter the contest in one or all our Facebook discussion groups – Rainy Side Gardeners Northwest, Pacific Northwest Native Plants, and Container Gardens Northwest – increasing your chances of winning. Simply post something different in each group. If you post the same photo or statement in each place, you're only entered once. Don't forget to answer the three questions, required to join the group. Questions? Drop us an email. Do you ever see characters in your flowers? I do. I see plenty of them. I'm either giving them human or animal characteristics. Or they tell me a story. 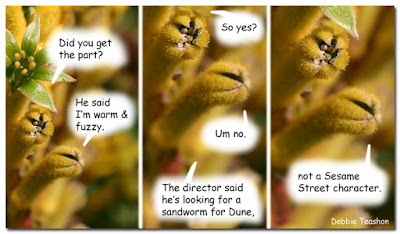 Fans of Frank Herbert's "Dune" will understand. Click on the image for a larger view. I wrote this in 2004. However, I'm not sure when I made the meme some years later. Nevertheless, I am posting this for the new year. You can read the poem below, or click on the image and read the image version. May your 2019 garden be blessed with abundance! I'm hopping mad. This morning while researching foxgloves, misogyny came screaming out from the pages of an old book from my shelves. I don't often use this particular book in research, but for my story, I needed some folksy, traditional uses of plants. Before I go further, I want to be clear that I don't have anything against science or medicine in and of itself. I know climate change is real, the earth is not flat, and science has improved our lives in many ways. Yet I also have a beef with science. "Better living through chemistry" has turned us into beings that scorch the earth with poisons that science has brought us. AND science doesn't have all the answers. My quibble here is science taking the credit for many things they claim a discovery. For instance, folk medicine. Many remedies now prescribed by doctors originated from herbs that healers throughout the ages successfully used to treat their patients. Scientists have taken credit for discovering it, when what they found came from indigenous people, midwives, and healers. Back to what brought me to anger. While looking through my books to help flesh out a story I am writing, I came across the following two paragraphs about foxgloves. "… Its long green leaves are powdered into digitalis, the cardiac stimulant that keeps millions of heart patients alive. This use was discovered in 1775 by English physician William Withering. He heard of an old woman in Shropshire who practiced folk medicine with herbs gathered in the countryside. A patient afflicted with excessive fluid retention due to congestive heart failure, whom Withering expected to die, was cured by this healer. From the woman's mostly useless bag of weeds, Withering identified foxglove as the key element in treating the swelling, or edema, associated with congestive heart failure… "
No. Withering did not discover what was apparently already in use by a woman who saved her patient. 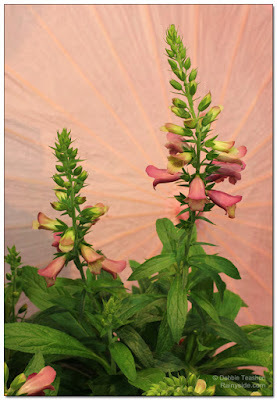 Most likely, digitalis was passed down through generations of healers. Digitalis is one of the deadliest, medicinal plants in the world, yet the woman gave the correct amount that saved the man while not poisoning him. Stop rewriting history; we can credit Withering with bringing it to mainstream doctors. He discovered a woman healer who helped him realize the plant's medicinal properties. The dismissive tone of that paragraph is what prompted me to write this. We will never know the woman's name or if in that "mostly useless bag of weeds" could have carried herbs that helped with side effects from digitalis, or other health issues associated with congestive heart failure. She is the hero in the story. Many mainstream medicines used today are known because of traditional folk medicines. To credit science with discovery is as absurd as crediting Columbus with discovering land in the western hemisphere is. He found human beings already there. I leave you with this image of a beautiful interspecies foxglove as a token of appreciation for all the women and men who helped heal others with their profound knowledge of herbs and plants before science "discovered them." Let's give credit to those whom credit is due. I love finding the unexpected. 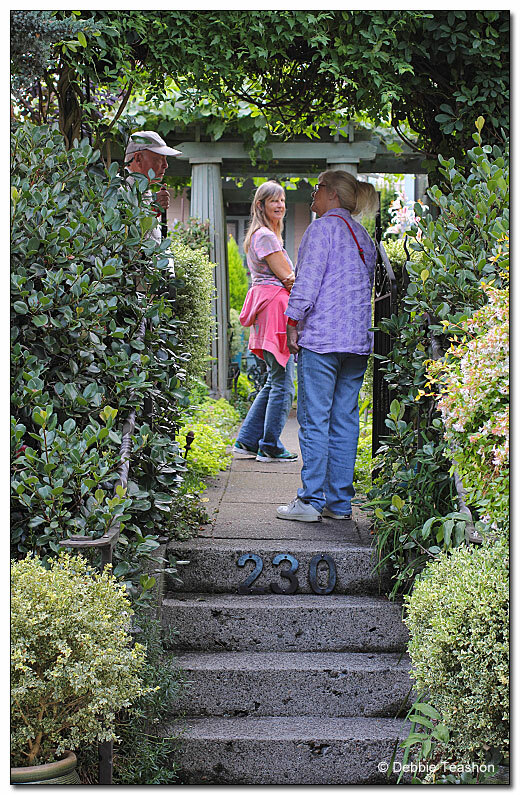 Last summer in 2015, I went on the Snohomish Garden Tour in the historic district. I was pleasantly surprised to find some unexpected art and other amazements. The first order of the day was crossing Puget Sound (I affectionately call the moat) via the Kingston/Edmonds Ferry. With the exception of one curmudgeon, it was a delightful tour. 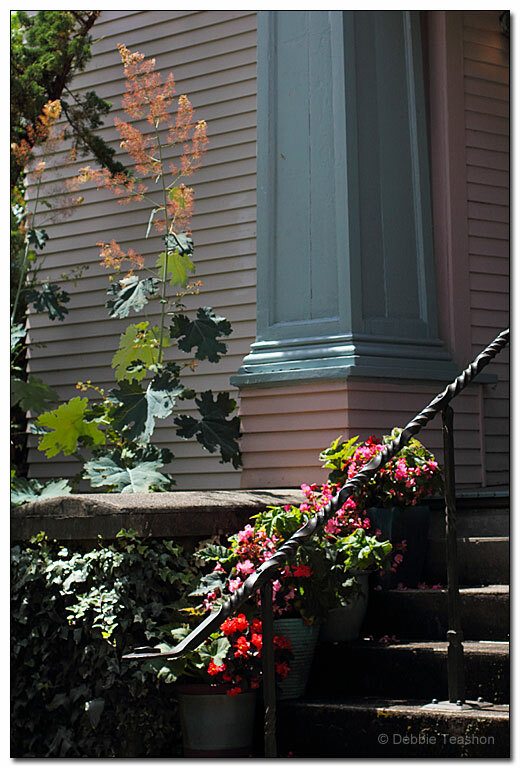 The plentiful gardens surrounding historic homes made it worthwhile. The docents in each garden made people feel welcome, and answered questions. I met one homeowner couple and enjoyed a pleasant conversation with them. All in a good day's tour. The sign said it was a church. 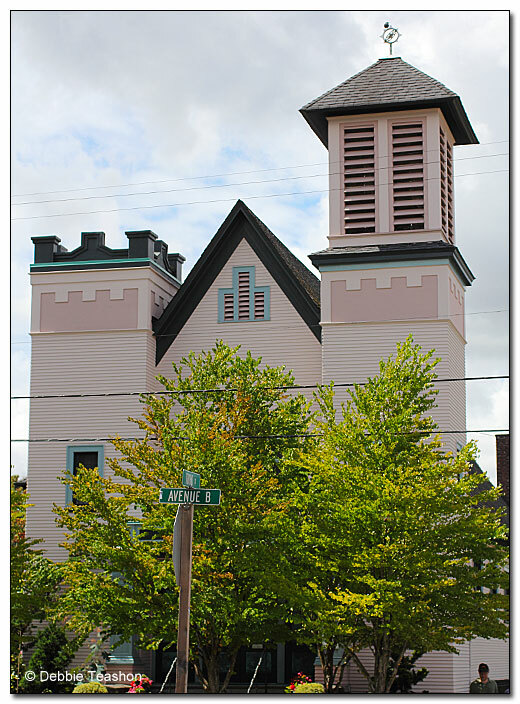 The surprise came when walking through the Snohomish historic district I came up to St. Michael's Catholic church that was on the tour. 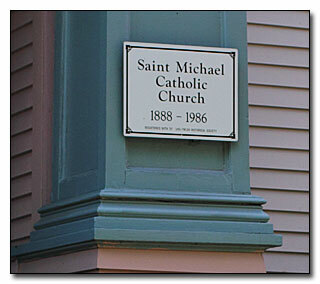 At least I thought it was a church. The sign said it was a church. It looked like a church. Near the front steps a tall plume poppy (Macleya cordata) stood tall. The garden entry was on the side of the church building. Down the path we came upon metal art pieces nestled in with the plants. Buddha! 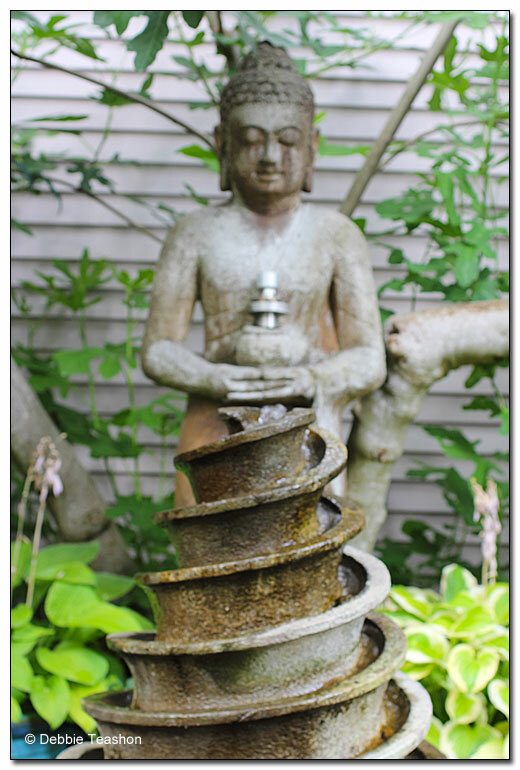 There was a Buddha statue in a Catholic church garden. How odd I thought. 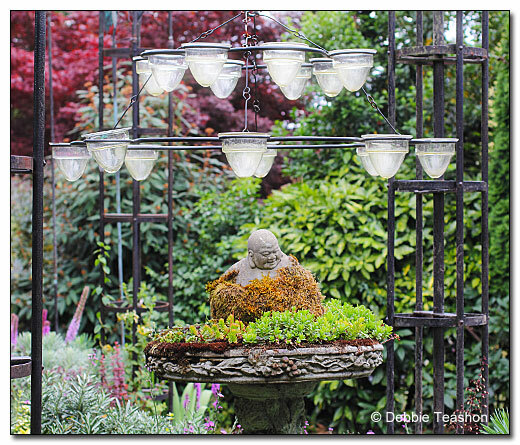 I came across another Buddha clothed in moss and sitting in a birdbath filled with succulents under a chandelier. 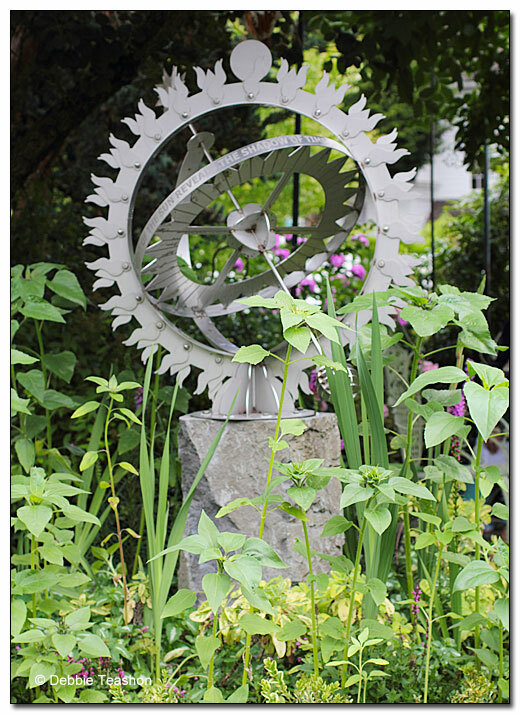 It wasn't until I was halfway through the garden that I realized this place wasn't a church – I was touring a private garden of artists Guzak and Blake of Angel Arms Works. That will teach me to read the descriptions before entering a garden! 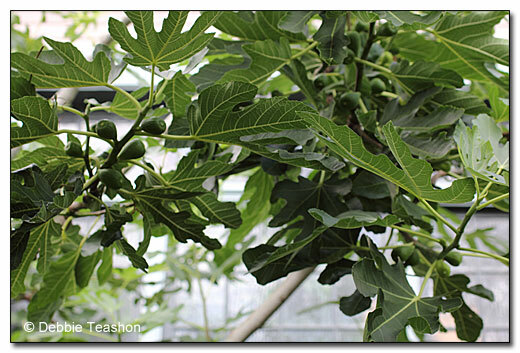 I didn't get the name of this fig tree loaded with fruit. 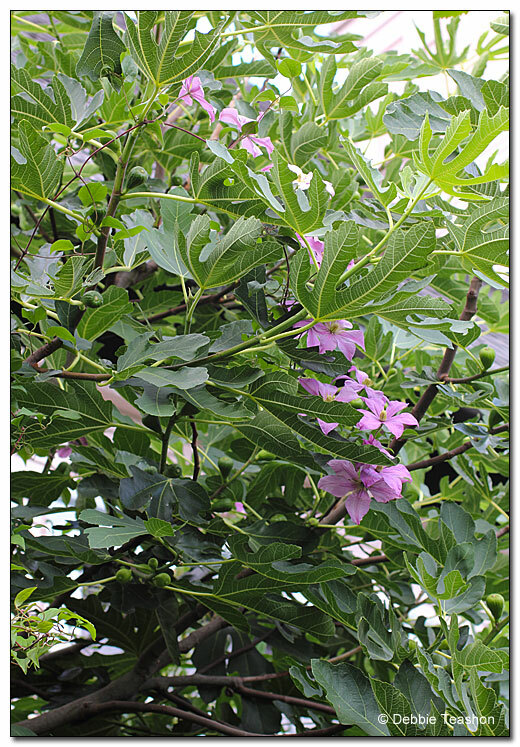 This healthy-looking shrub also had a clematis growing up through its branches. 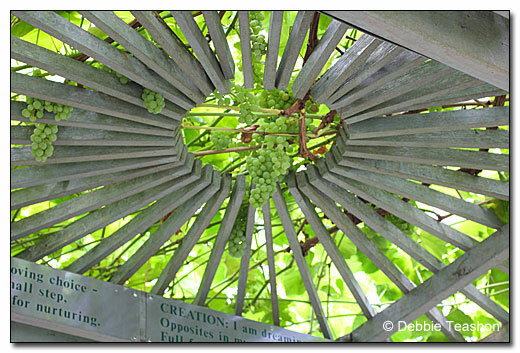 Finally the crowds thinned out and I went over to take a good look at the arbor. 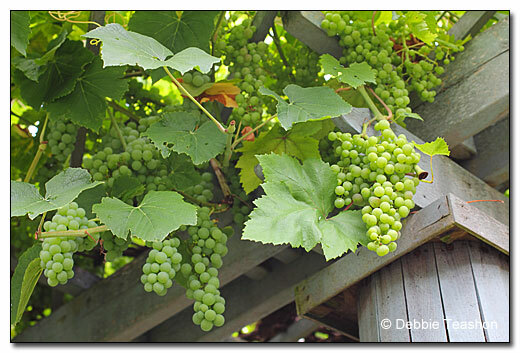 A large grape vine covered it completely. It too was loaded with fruit. 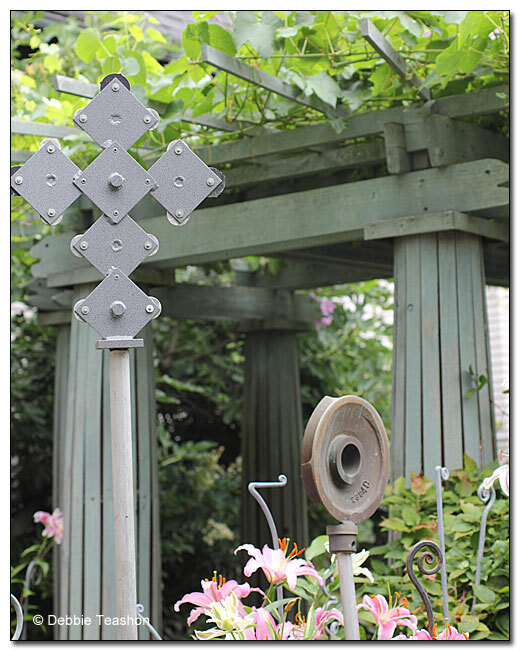 More metal art placed strategically around the garden. Another vine is climbing up into a covered entryway. Do you see the faces? I loved the simple containers overflowing with plant life! 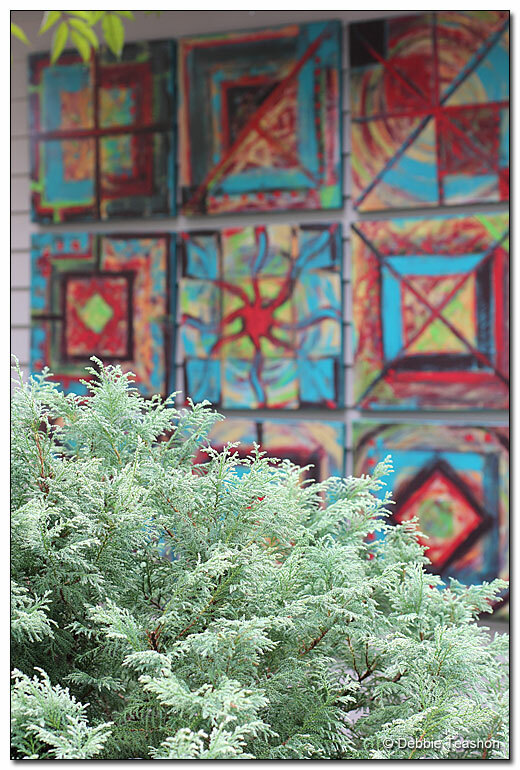 More unexpected art on the wall behind the conifer. Down the road in the Kerkley garden a couple of folk art pieces caught my eye. 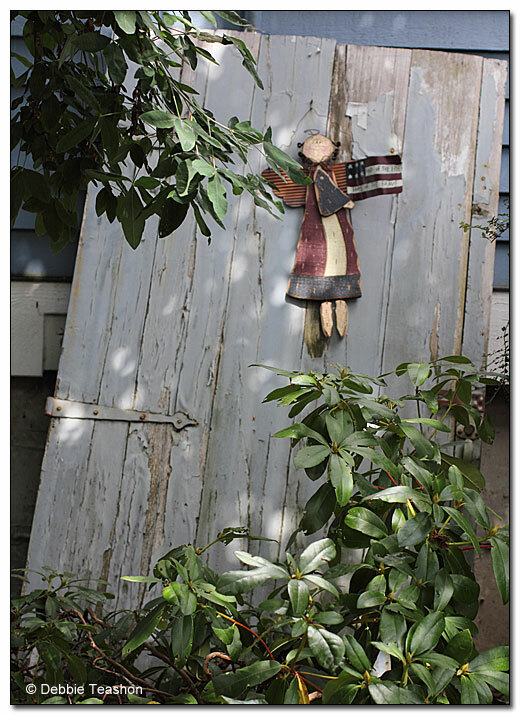 I liked how the door with peeling paint looks abandoned leaning up against the house, with a little angel sticking by its side. 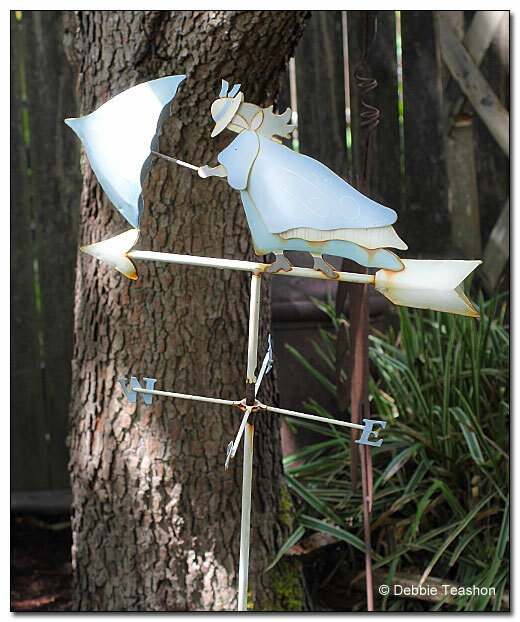 An old weather vane in another part of the garden. 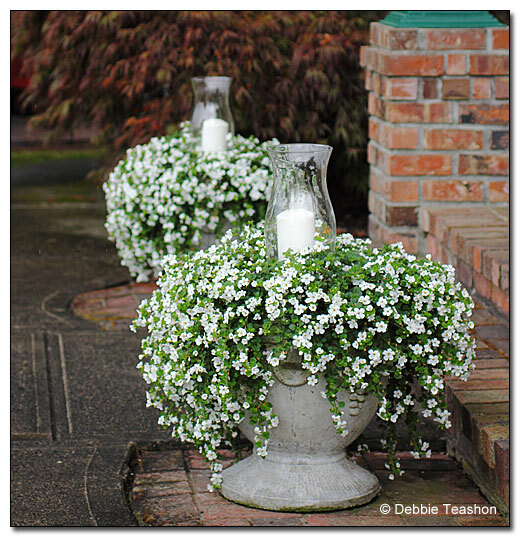 In the Roberge's delightful garden, two urns are filled to overflowing with the white flowering Bacopa and flank the steps leading up to their porch. I like how they placed a candle in each one. Have a piece of succulent cake. 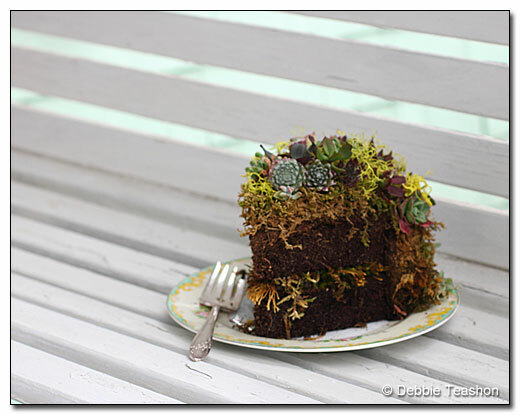 Made with soil, moss and succulents, this was a fun surprise sitting on one of the porch benches. 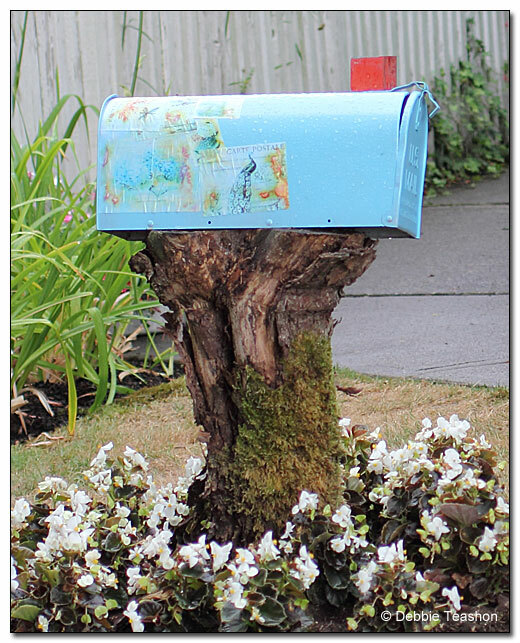 Going around to the side of the house a mailbox sits on an old stump. Postcards adorn the box. An iron scarecrow stands guard over the vegetable garden. What happened to its head? Finding the unexpected is the best part about touring gardens. 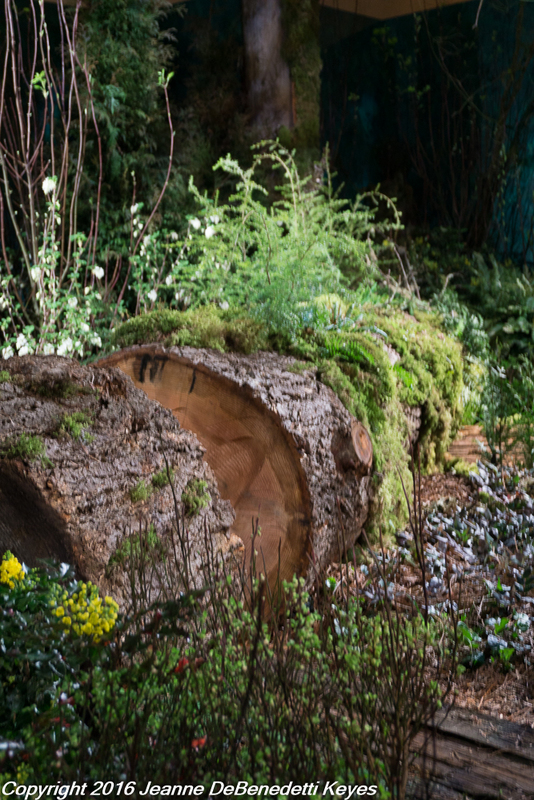 The display gardens at the NWFGS never fail to amaze audiences every year. 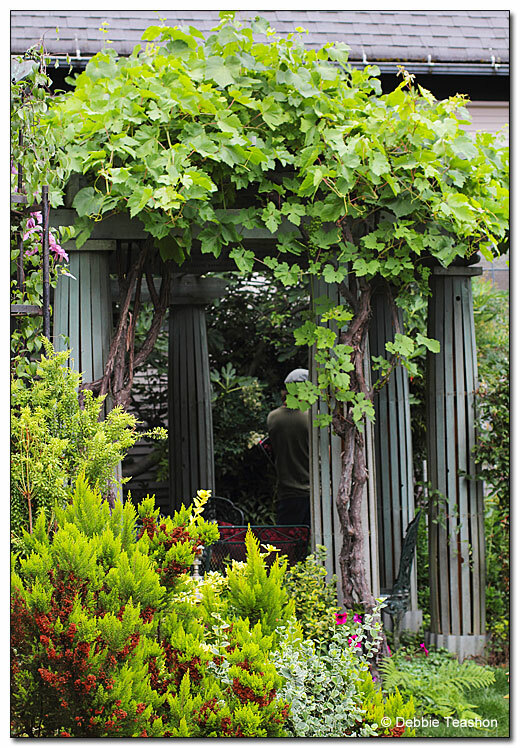 Many feel that the gardens are “over the top” and don’t relate to the home gardener. 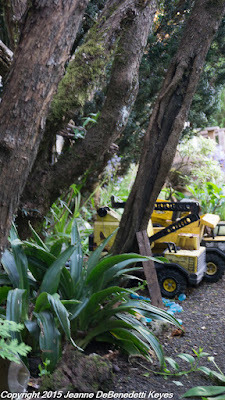 I think a gardener can take away something, anything, from the design, or the use of the plants or path materials etc. from all of the gardens but some will particularly resonate. This year the show theme was “America the Beautiful”. Some of the gardens captured this idea better than others. I think a garden “works” better if the plants and hardscape “fit” with the environment, the house or a theme for the garden. "The Hoh: America’s Rain Forest garden", designed by Phil Wood for the Washington Park Arboretum in Seattle, Washington epitomizes the Olympic National Forest and shady gardens around the Pacific Northwest to the last fern frond. 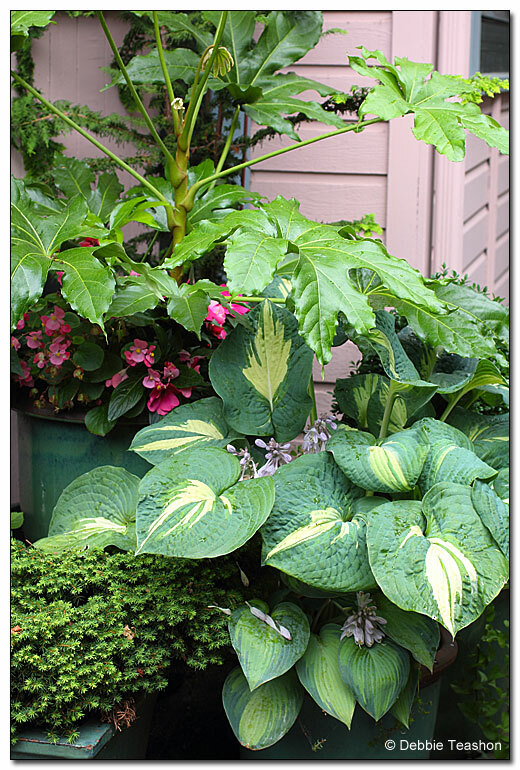 Although I am a sucker for large-leaved, sunshine loving plants like hardy gingers, cannas and bananas, there is something about the bright green, moss covered big leaf maples and evergreen trees, and sword ferns that make me feel so peaceful and at home. I loved the variety of native plants in this garden. There were a lot of great plants, even quite a few lesser well-known plants such as bear grass (Xerophyllum tenax) and cow parsnip (Heracleum maximum Bartram).The dripping water was a great touch and good reminder of the 140 inches of rain that fall on the Hoh Valley each year. 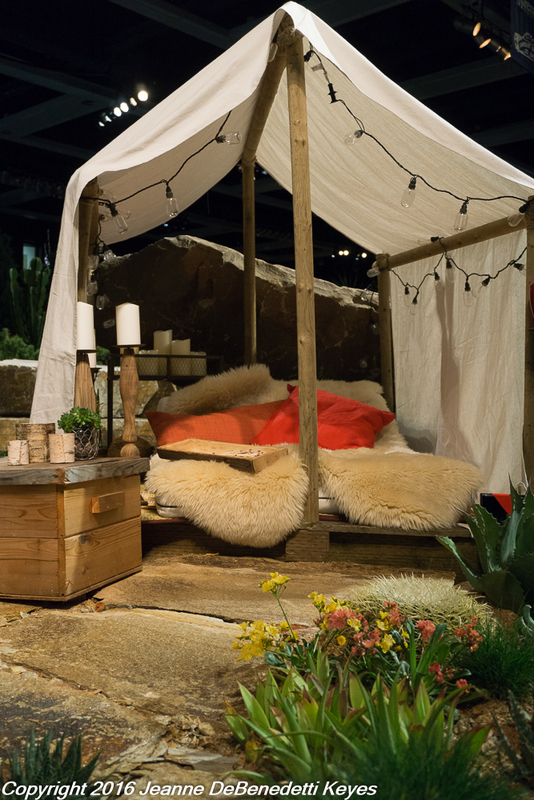 Another favorite was "Southwest Serenity" designed and created by West Seattle Nursery. 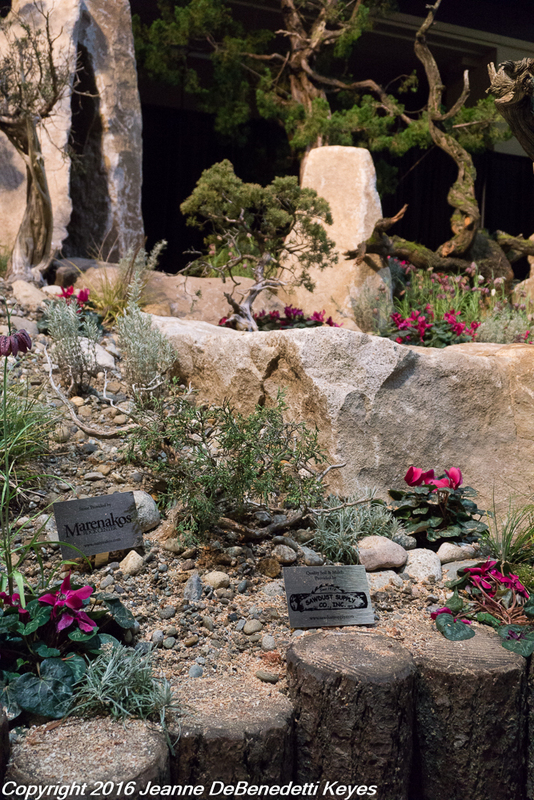 This garden was inspired by many of the National Parks in the American Southwest. I think going for a general look and feel of the Southwest was a great way to showcase plants such as the bright orange, succulent foliage of Euphorbia tirucalli ‘Sticks on Fire’ or the large-leaved agaves that may not be hardy in some of the higher altitude or more Northern Southwest Parks. The bright sunset colors of the lewisias (Lewisia cotyledon), while native to Southern Oregon and Northern California, reminded me of the many different wildflowers that grow abundantly in the Southwest. The rosy colored, piled rocks were spot on for evoking the buttes, hoodoos and reefs of Zion, Canyonlands or Grand Canyon National Parks. And who wouldn’t love camping with all the comforts of home in this sweet little tent? Elandan Gardens, Ltd, always creates beautiful gardens with great rocks and wonderfully pruned trees and shrubs, reminding me of alpine and subalpine regions of Western United States, definitely “America the Beautiful”. This year, though, I think they missed the mark. The plants displayed in the garden, entitled "Capturing High Desert Beauty-Oregon's Smith Rock", cyclamen (Cyclamen sp.) and checkered lily (Fritillaria meleagris) are low-growing, wildflowers. Species varieties of these plants, along with craggy, windswept evergreen trees, might grow at the high altitudes of somewhere like the Sierra Mountains. The landscape of Smith Rock State Park is much lusher with tall sage-brush, native grasses and robust junipers. The deep river waters of the Crooked River flow by. 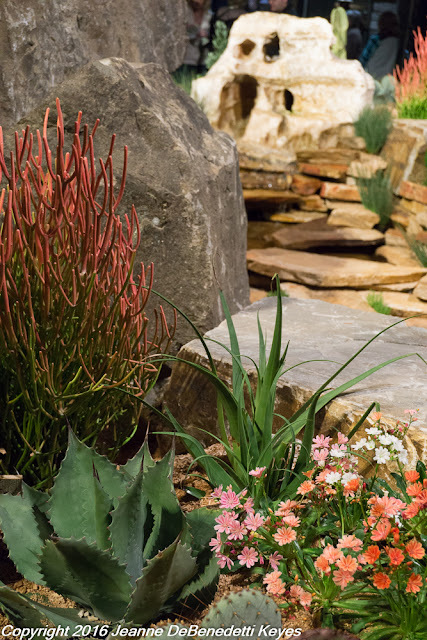 The rocks are made up of welded tuff or compressed volcanic ash and are very craggy; yet don’t have the same “feel” or look of the rocks in the display garden. 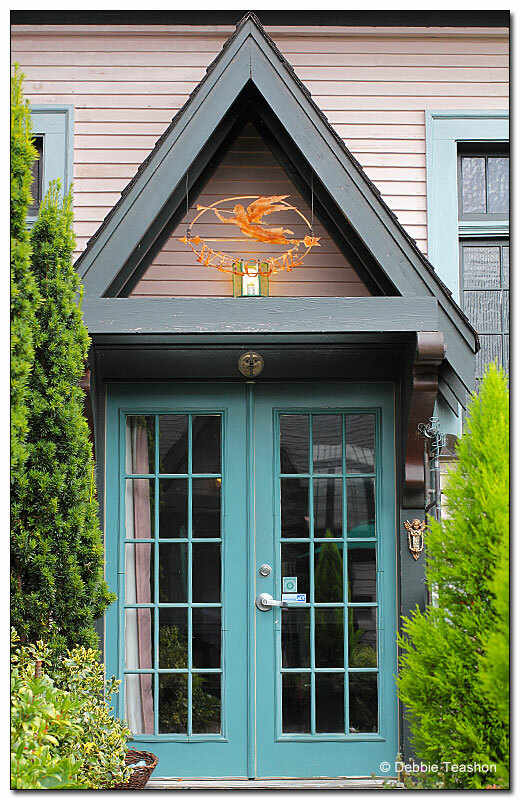 So, while the garden is beautiful and expertly crafted, it doesn’t fit the “theme”. These details are minor in the grand scheme of things. Most people wouldn’t notice. 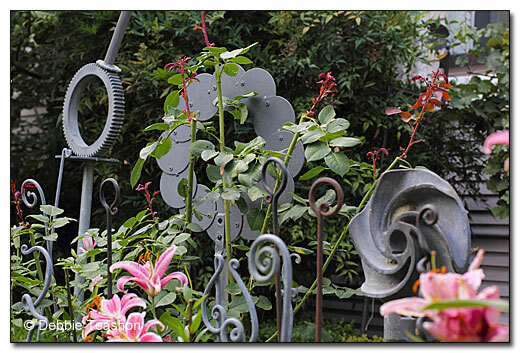 However, it is the details that make up an idea, the presentation of the garden, so to speak. 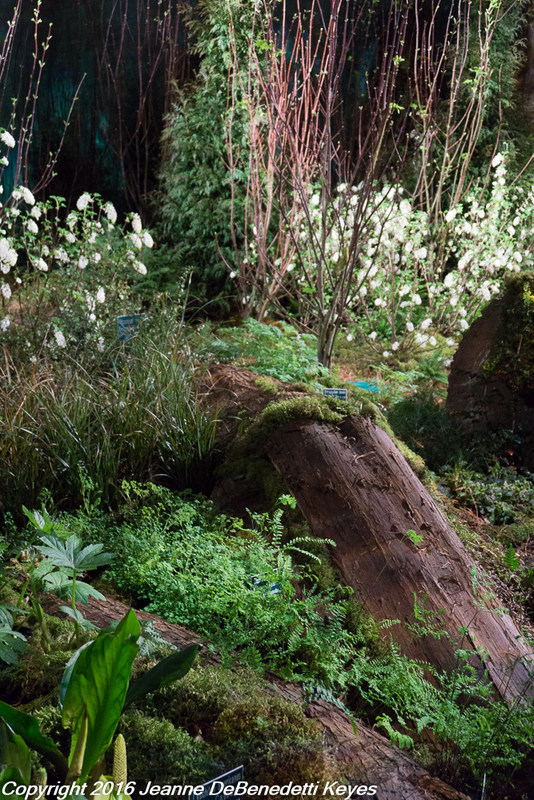 Oddly enough, I heard others express a similar criticism about another garden at the show. Maybe that is the danger of selecting a well know place to pattern a garden after. In the end, it doesn’t matter as long as you like the garden and it “works” for you. In the case of this wonderful landscape, I would just change the sign to say: This garden inspired by Sierra or Rocky Mountains! Do you love snow? I do. I love to ski, snowshoe, and throw snowballs. However when it come to snow and the garden, maybe it’s more of a love-hate relationship. I love how the snow outlines the branches and trunks of deciduous trees and hangs like powered sugar on the evergreens. However, ice is another matter altogether. Many people of Portland, Oregon are cursing the snow and ice this week, as they slip and slide on the way to work. I can still see icy chunks of snow melting, ever so slowly. As beautiful as it is, will it harm my plants? 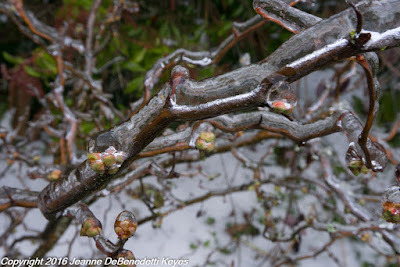 As I walked along the garden paths, I was amazed at how many of my large shrubs and small trees were bent almost double under the weight of an inch of ice. Gingerly tiptoeing along, listening to the sounds of cracking ice, I planned my route, trying not to get a flush of cold snow down my back or hit by falling icicles. 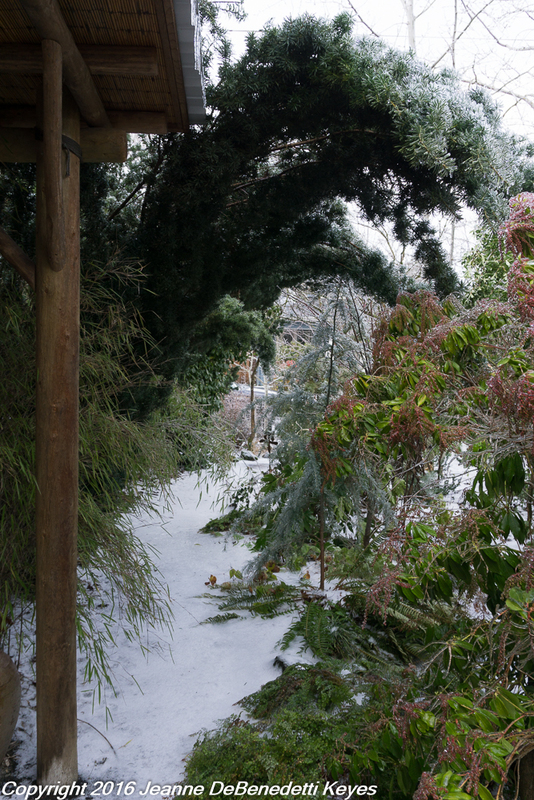 The large-leaved evergreen trees always seem to get the worst of it. Thick, heavy coating of ice on large leaves can cause branches to snap off, severely damaging the plant. I am relieved to see that the Madronas(Arbutus menziesii ) , the Magnolia (Magnolia Grandiflora)and assorted Camellias (Camellia Japonicasp.) and Rhododendrons (Rhododendronsp.) have all bounced back to their normal shapes with no breakage. Unfortunately, the Yews (Taxus baccata ‘Fastigiata’) did not fare so well. I will need to prune quite a few of these branches. Look how the Yew in this photograph hangs over the path and other plants; like a huge, green, claw, ready to grab the nearest passersby. As I stop to take pictures and to document any damage, I noticed how the ice reflects the shape of leaves and makes perfect bubble-like formations out of the flower buds. The thick ice on the contorted branches of this flowering quince (Chaenomeles japonica ‘ Apple Blossom’) glisten in the late afternoon light. 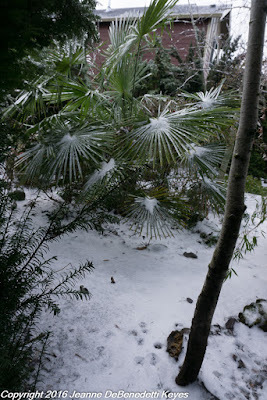 I love how the palm in this photograph (Trachycarpus fortunei) takes on a new shape and structure with the weight of the snow and ice. The verdict is in. This year we got lucky, at least for deciduous and evergreen trees and shrubs. The weather system came in late enough in the year that most of the small perennials were already dormant. As painful as it is for the humans, a slow thaw seems to be best, allowing leaves to slowly unfurl and branches to lighten as the ice melts and evaporates. It will be interesting to see if large-leaved succulents such as agaves and cacti make it through the winter. This old photograph gave me a walk down a path of paint and birdhouses. 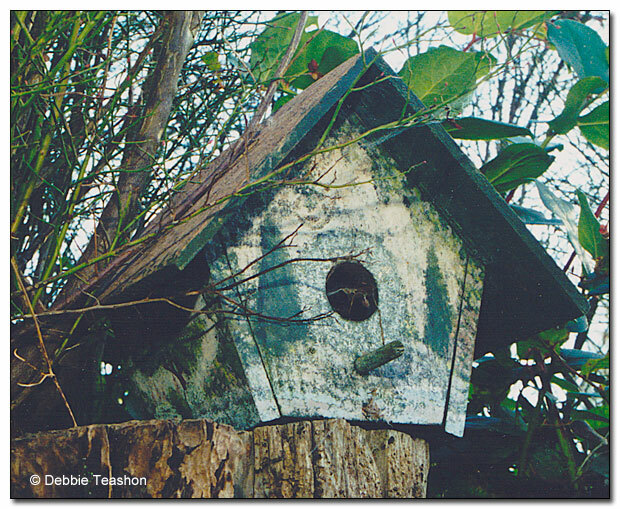 An old hand-painted bird house. Many years ago, I hand painted some birdhouses that I sold out of a gallery. With regret, the only one I ever photographed was my first one, and only after I found it on a stump in the garden years after I painted it. The huckleberries and salal grew up around it and hid it from view. I had forgotten I placed it there. The landing post had rotted a bit and bees used it for a nest. 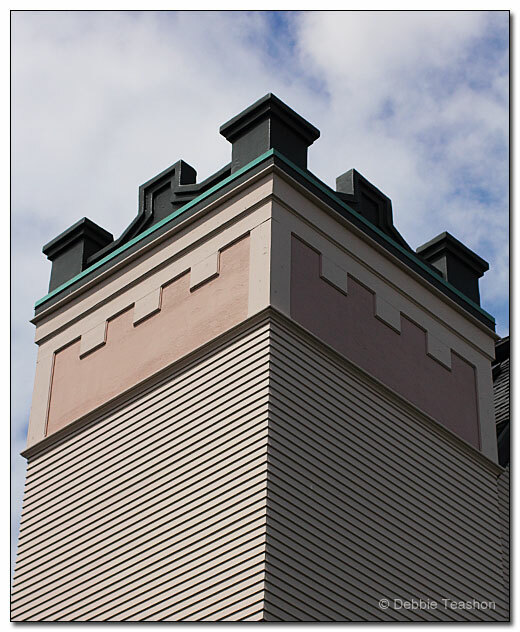 The front had faded, yet the shaded sides still had much detail. Originally, I painted intricate garden scenes on it with a path that went all the way around with layers of trees, shrubs, flowering vines, and perennials. 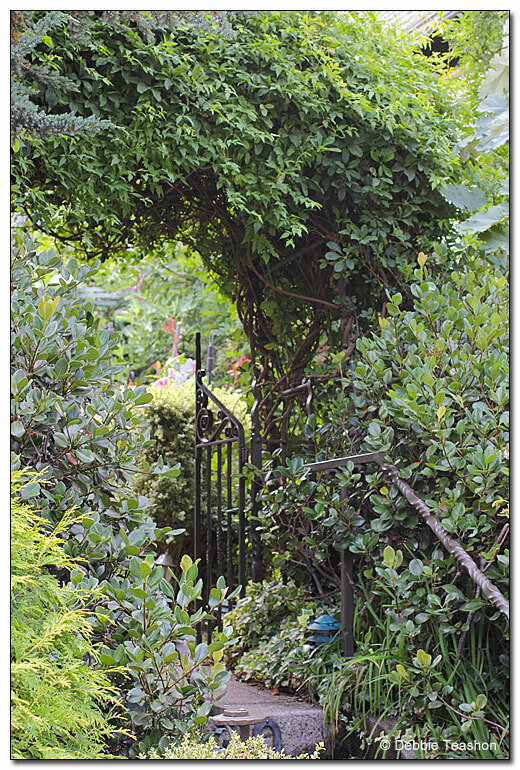 The path led you through a lush garden. I regret that I didn't photograph all sides of every one I painted — silly me! I loved designing the imaginary gardens as I painted the houses. Sadly, I stopped painting them because the person that made the unpainted birdhouses for me, quit building them. 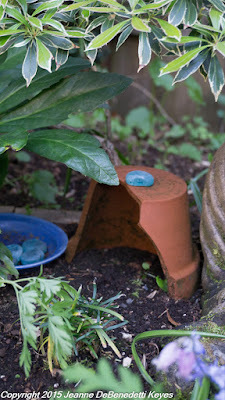 Finding unpainted wood birdhouses were either too expensive to paint and resell, or too rustic. Regardless, it was fun to stumble across this old photograph, and relive some old memories. 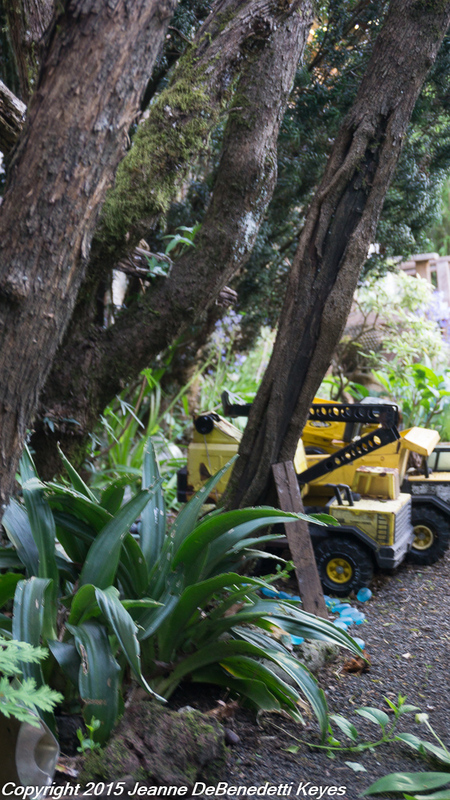 Children and Plants- Two things a Gardener cannot control! When did I ever think I had control over my garden? 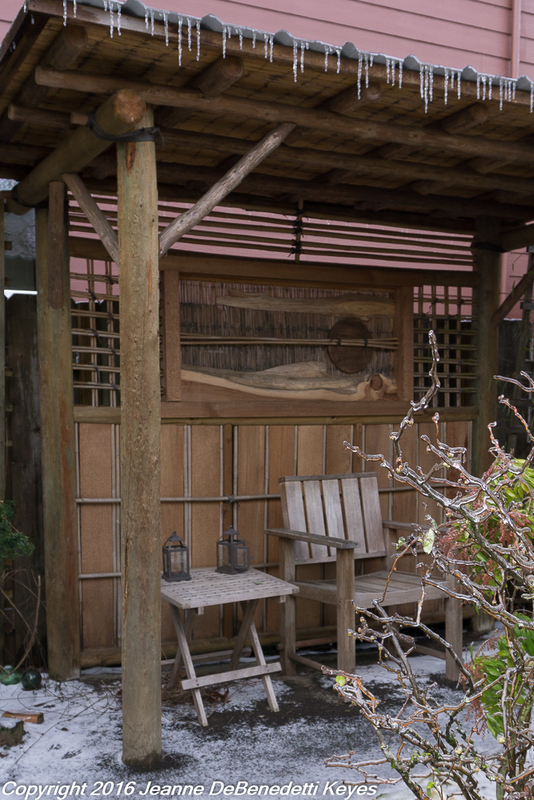 As gardeners, we spend many hours designing, planning and planting a garden with a vision in our minds. We do our best to match soil and sun conditions to the plant but it is not always enough. Plants, like children, have a mind of their own and will decide where they will grow and thrive. At best, we are managers of the garden, possibly master gardeners but not masters of the garden. Add kids to the mix and I now know that I am certainly not the master of the garden but more along the lines of maid-servant - to both kids and garden. When my daughter wanted to add a fairy garden, I thought that was a fine idea. Great way to be outside with her, have fun, and provide interesting entertainment that does not involve a computer! I helped her pick an out a secluded spot. She proceeded to collect rocks, pots, bricks, glass and all kinds of cool treasures to make a fairy village. The fairies even have their own earth-moving vehicles! How about one of these big blue pots, Mom, she says? Can I use these? Okay, I thought, these glazed pots don’t necessarily need plants, although I do have plants that I planned to put in those pots. I can share. We bought a few miniature plants. The next step, obviously, was to add a few figurines from the bonsai section at the nursery. 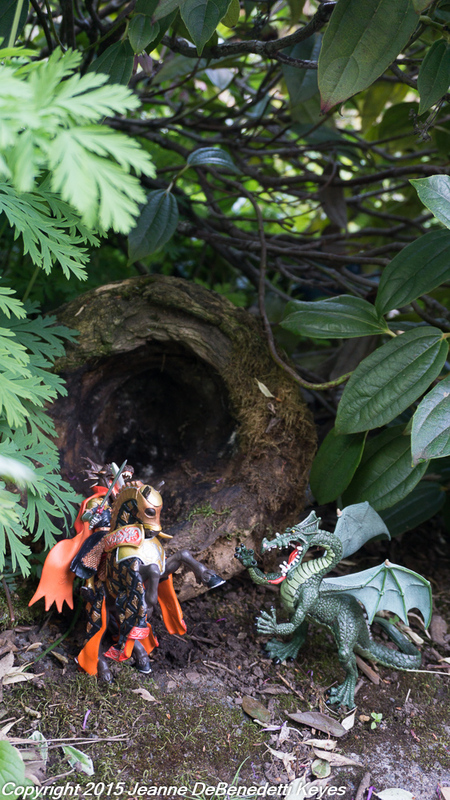 And how much more fun would it be to bring out the Schleich play figures like these knights, ponies, dragons and fairies. Now, the pot is way too small. Lo and behold, the fairies are on the move! 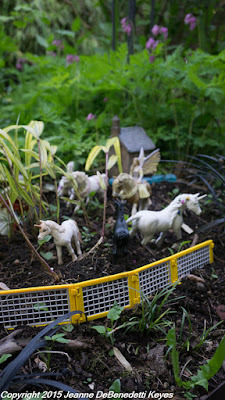 The fairies colonized a new section of the garden! I had moved a daylily, leaving bare soil and now there was plenty of room for more fairies. Later in the week, I noticed that a jack in the pulpit (Arisaema sp. ), I planted last fall was no longer in its spot. I inadvertently placed it in the location of the new fairy garden and totally forgot about it until it pushed its way out of the ground. Sophia decided to “move it” without telling me, possibly hoping that I would not notice. The soil had been smoothed over so I knew it had not been accidentally uprooted and removed while weeding. After several minutes of questioning she finally remembered where she tossed it. We re-planted it, both of us remorseful but happy to have come to agreement about the plants and creating new gardens. 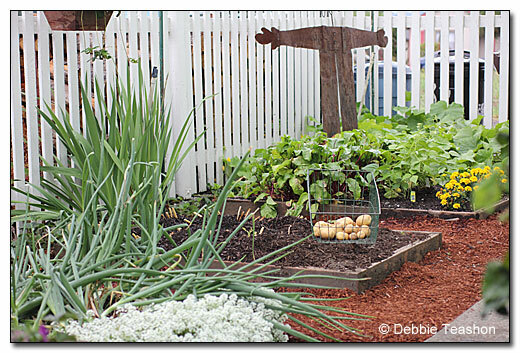 How do we share the cultivation and usage of the garden with family members? In the end, I know that I am happy to share the garden with my daughter as long as we can negotiate the next fairy settlement!